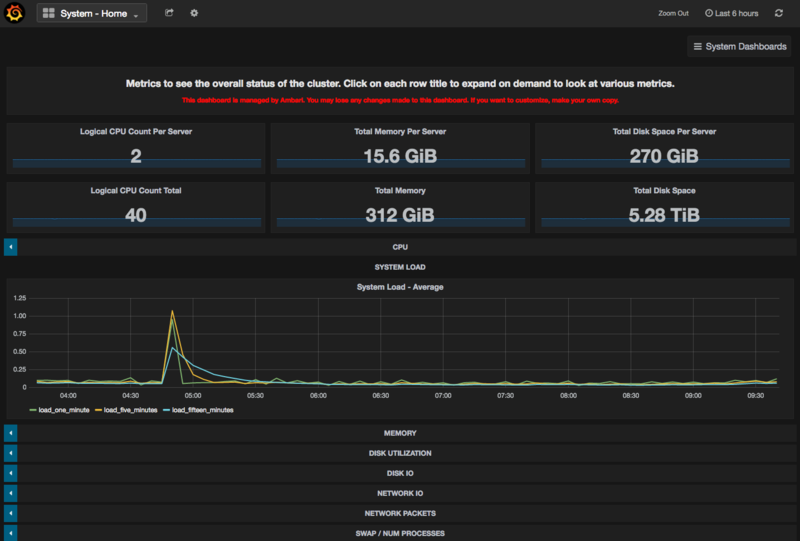 Ambari Metrics System ("AMS") is a system for collecting, aggregating and serving Hadoop & other Stack services and system metrics in Ambari-managed clusters. This datasource plugin allows you to visualize all the metrics that are available via the AMS Collector API. Either clone this repo into your grafana plugins directory (default /var/lib/grafana/plugins if your installing grafana with package). Restart grafana-server and the plugin should be automatically detected and used. You can automatically import pre-built dashboards for AMS & Ambari by editing the grafana.ini config file (Default location is at /etc/grafana/grafana.ini) and editing this (should be at the end of the file). If you've cloned the plugin elsewhere, replace the path above with that accordingly.